To a naïve reader, the statements present a very rosy picture of Ethiopia and hide the income inequalities, adjunct poverty and dismal standard of living that persist and the true state of the Ethiopian economy and its effects on the majority of the population. Economic metrics can be misleading when viewed through the mirror of Gross Domestic Product (GDP), as progress may appear to be greater than what it really is. The GDP metric was developed in the United States during World War 2 as a tool to plan the enormous expansion in military procurement, while controlling inflation. GDP simply totals up the amount spent for all final goods and services produced within the country. GDP only deals in positive numbers, so doesn’t subtract out things like future obligations- it is easy to boost the economy by borrowing a lot of money. GDP measures only output, and makes no claims on the quality of that output, let alone on subjective concepts such as social progress or human happiness. GDP is the total value of all products and services bought and sold, a measure of money changing hands. 3. GDP also has nothing to say about how income and wealth are distributed among the people. The GDP values growth over the things that really matter to people, such as access to food, Ethiopia's children eating from trashshelter, clean air and water, and a healthy and safe environment for all. GDP should not be considered a definitive measurement of human welfare, as the case of Ethiopia clearly illustrates. So how are Ethiopians faring in this “growing economy”? How has the “double digit” growth in GDP translated in the lives of the Ethiopian people? According to the United Nations, about 90 percent of the population suffers from numerous deprivations, ranging from inadequate health care to insufficient access to education. Inequality and the failure to make a dent in urban poverty are exacerbated in Ethiopia by high inflation, which hurts the poor disproportionately. Ethiopia is characterized by a predominantly rural and impoverished population with limited access to safe water, housing, sanitation, food and health care. An Oxford University report said some 90 percent of Ethiopians still live in poverty, second only after Niger from 104 countries measured by the Oxford Multidimensional Poverty Index. The most recent data shows an estimated 71.1 percent of Ethiopia’s population lives in severe poverty. ethiopia_03Ethiopia faces famine where more than 13 million people need food aid. 6.2-million people will need emergency food aid while another 7.5-million chronically food-insecure Ethiopians receive assistance through the U.S.-funded program known as the Productive Safety Net. In TPLF’s Ethiopia, one in eight children die before their fifth birthday and over 150,000 children live on the streets. Out of the five million orphaned children, about 800,000 were orphaned by HIV/AIDS. There are 1.5 million people in Ethiopia that are infected with HIV (sixth highest country in the world). A look at Ethiopia’s booming adoption economy finds the government of Ethiopia at its center-from ownership of the mushrooming orphanages and adoption agencies, the minority regime has no qualms about selling of Ethiopia’s children. Encourage Africa  says that Ethiopia counts one of the largest populations of orphans in the world. Of the 143 million orphans worldwide, more live in Ethiopia than any other country in the world. Gains in income that come at the expense of future income, at the expense of future generations shouldn’t really be counted as gains. They should be counted as borrowing against the future rather than lifting Ethiopia’s level of income. In Ethiopia, the government enjoys a monopoly over domestic as well as international borrowing. Between 2000 and 2012, Ethiopia’s international public debt increased by 85% from US$5.339 billion to US$9.941 billion. The World Bank says that “the external indebtedness of African countries is an obstacle to the ‘restoration’ of the conditions needed for growth.” The huge debt burden acts as a threat to the economic performance given the wide spread poverty and structural rigidities in these countries. According to Mundi, Ethiopia’s external debt stands at $11.99 billion (31 December 2013 est. ), others have put it at about “12 to 14 billion USD”. In 2005, the International Monetary Fund announced that it would provide 100 percent debt relief on “all debt incurred by Ethiopia to the IMF before January 1, 2005” that remains outstanding. This also contributed to Ethiopia’s “double-digit GDP growth”. Despite that debt forgiveness, Ethiopia recorded a Government Debt to GDP of 27.40 percent of the country’s Gross Domestic Product in 2013. The total public debt, which includes domestic debt (from domestic sources), stands at 36 % of GDP. Government Debt to GDP in Ethiopia is reported by the National Bank of Ethiopia. For whatever reasons, the World Bank insists on providing Ethiopia with even more loans to squander at the expense of future generations. As the joke goes, when Bill Gates walks into a bar, the average customer suddenly becomes a millionaire. High-end people raise the average, and that doesn’t mean that normal people in the room are any better off. When the regime in Ethiopia brags about “middle income status” for Ethiopia, it is referring to the few regime cadres and loyalists who have amassed wealth at the expense of the majority. It does not need much query to know who the new millionaires are in today’s Ethiopia under the entrenched TPLF regime. Who is benefitting from the sale of Ethiopia’s precious resources, sale of Ethiopia’s most fertile lands, or the sale of Ethiopia’s children through adoption and other illicit conduct, or the debilitating corruption that prevails in all economic sectors in Ethiopia? Can we say there is economic growth in Ethiopia when hundreds and thousands are forced to leave their villages and homes, and when there are more than 100,000 young people roaming around the capital in search of food and twice that number who are destitute? Does the much touted “growth in GDP” indicate progress in Ethiopia, when the increasing income accrues to a very small section of the Ethiopian people? According to the regime and its handlers, Ethiopia has recorded some of the “highest growth rates in the world”-over 10 per cent in some years. However, Ethiopia’s Human Development Index (HDI) and its relative ranking have not moved appreciably during the past decade. Ethiopia ranks 173rd out of 186 countries in the latest UNDP Human Development Report. 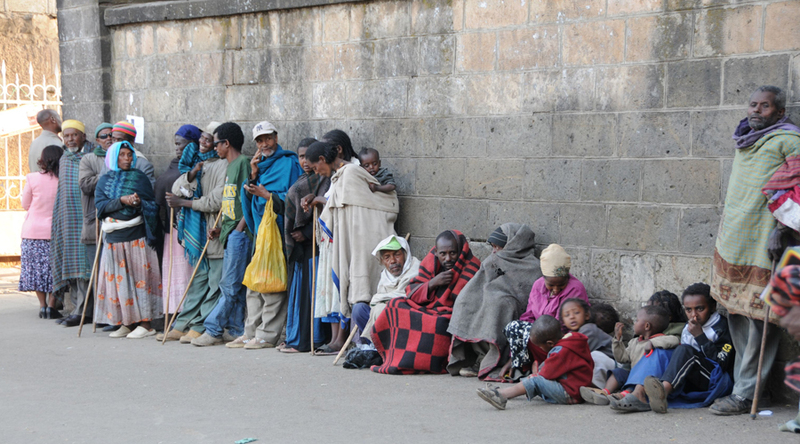 Ethiopia remains one of the poorest and least developed country in the world. Social Progress Index is the most inclusive and ambitious effort ever attempted to measure social progress comprehensively. It defines social progress according to three broad dimensions: Does a country have the capacity to satisfy the basic human needs of its people? Does a country have the institutions and conditions in place to allow its citizens and communities to improve their quality of life? And does a country offer an environment in which each citizen has the opportunity to reach his or her full potential? No countries score in the top half for all 12 components of the index, which are nutrition and basic medical care; air, water and sanitation; shelter; personal safety; access to basic knowledge; access to information and communication; health and wellness; ecosystem sustainability; personal rights; access to higher education; personal freedom and choice; and equity and inclusion and higher or lower GDP is not a determinant of the scores. According to the Social Progress Imperative, Ethiopia ranks at the bottom, 126th out of 133 countries, making it one of the lowest scores on the Social Progress Index. The number of Ethiopians in need of relief food assistance until the end of 2014 was estimated at 3.2 million, about 18.5 percent more than in the first half of the year. Ethiopia is WFP’s largest country of operations. Access to water supply and sanitation in Ethiopia is amongst the lowest in Sub-Saharan dlp4_061071806.psAfrica and the entire world. Ethiopia boasts a population of about 83 million people and which only 38 percent have access to safe drinking water sources and only 12 percent of the population use improved sanitation facilities. Over half of Ethiopia’s population lacks access to drinking water, in spite of the large number of water resources available in the country, particularly in the subsoil and hundreds fall ill and die daily as a result of drinking contaminated water. The growth in Ethiopia’s GDP is not translating to access to water for more than half of its population-water is life- Water being one of the most essential elements to health, without it, it does not matter how big the GDP growth in Ethiopia is. The mainstream media and their sponsors ought to pay heed to the basic human needs of the Ethiopian people who are suffering under the clutches of an entrenched minority regime suffering from an incurable case of inferiority complex and crab mentality. Their children are paying the price for the regime’s mercenary adventures and military forays and wars of aggression and occupation. The poor people of Ethiopia are paying for the regime’s excesses and bearing the brunt of its repression. When GDP is measured, it may be higher in the aid dependent Ethiopia ruled by the mercenary minority regime, and the “Darling of the West”, than in self-reliant Eritrea, but when life expectancy, food security, access to potable water, education, health, peace and security, etc. are measured, Eritrea’s social justice path is far more desirable, and more importantly sustainable. Touting Ethiopia’s growth in GDP is no longer something to cheer about, and it is past time to establish a new way to measure Ethiopia’s progress and stop insulting the intelligence of the Ethiopian people. Instead of proving diplomatic, political, military shield and support to an entrenched regime that has been abusing the human rights of the Ethiopian people, stripping them of their dignity and pride and painting a rosy picture of an economy in which 60% of the regime’s national budget is supported by donors, it behooves Addis based journalists and diplomats to stop shoving the truth under the rug and call a spade a spade…you owe it to the people of Ethiopia on whose backs you have enriched yourselves. Ethiopian-land-giveawaySo, to paraphrase Robert Kennedy, the Gross National Product does not allow for the health of Ethiopia’s children, the quality of their education, or the joy of their play. It measures everything, in short, except that which makes life worthwhile for the people of Ethiopia and future generations who are at risk.